Obituary – Dunagan, Alma (Zavodny) « Perry High School Alumni Association, Inc.
Alma Antonia Zavodny Dunagan, 93, of Perry was the daughter of Joseph P. and Pauline (Schultz) Zavodny. She was born February 9, 1916, on a farm near Brainard, Nebraska and died Wednesday, January 13, 2010 at Perry Green Valley Nursing Home. Alma graduated from Perry High School in 1933 as valedictorian of her class. Alma started teaching in 1936 at twenty years old at Fairview School, a one-room schoolhouse in Noble County. Later teaching at Long Branch School near Red Rock, she met her future husband, Newton Dunagan, when he delivered fuel to the school. Newton and Alma were married on September 3, 1939, at the home of her sister and brother-in-law, Mr. and Mrs. Virgil Mornhinweg. The couple established their first home in Red Rock where Mr. Dunagan operated a gas station. After America’s entry into World War II, Alma and Newton moved to Oklahoma City where Newton worked at Tinker Field, and Alma finished her bachelor’s degree at the University of Oklahoma. Alma then taught at Riverside School in Oklahoma City. The couple moved to Perry in 1945. Alma was a teacher in the Perry Public School district for 33 years and was voted Noble County Teacher of the Year. She retired from teaching in 1978. Alma was an active member of the Perry First Christian Church and taught Sunday School for many years. 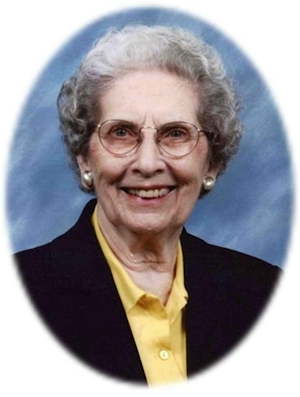 She was a member of the American Association of University Women, Petunia Garden Club, Perry Study Club and First Christian Church Business Women’s Guild, and First Christian Church Quilting Guild. Memorial services will be held at the First Christian Church, Perry Oklahoma at 10:00 a.m. on Monday, January 18, 2010. Rev. Martin Foster will officiate. Internment was at Grace Hill Cemetery in Perry. Services are under the direction of Brown-Dugger Funeral Home. Alma is survived by two daughters, Jane Frazier and her husband, Tom, of Pensacola, Florida and Ann Dunagan of Tulsa, Oklahoma; daughter-in-law Kathy Dunagan of Pensacola, Florida; three grandchildren, Joshua Frazier and wife, Shannon of Wilmington Delaware, Sarah Cahoon and husband Joshua of Stafford, Virginia and Madeline Dunagan of Pensacola, Florida; five great grandchildren, Noah, Morgan and Ethan Cahoon, Meredith and Audrey Frazier. Alma was predeceased by husband, Newton Dunagan, Jr. and son R.N. Dunagan, III.